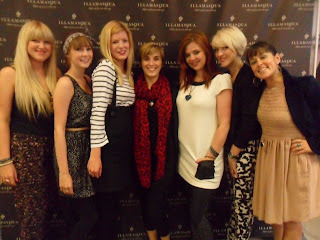 If you haven’t already seen Illamasqua’s ‘Born Again’ Interview with BAFTA winner Vicky McClure; take a look now! BAFTA winning actress Vicky McClure joined us at our Headquarters on Tuesday 26th July, along with Illamasqua founder Julian Kynaston and Head of Professional Development, Spob. A live Q&A took place to answer your questions, and we received some very insightful answers. We posted Julian and Spob’s responses last week (click here and here to read them) and here are Vicky’s answers to the questions you put forward, enjoy! Ethan Payne: Are there any make-up looks that you consider your signature style? Such as a look you keep coming back to? Vicky: The one I’m wearing (laughs). Ever since I began working with Illamasqua the way I apply my makeup and how daring I am has changed. I would say my signature look is something quite simple, yet defined, and of course I am never without Skin Base Foundation! I loved my look at the BAFTA’s. Louise Patterson: Hi Vicky, I love Born Again! How did you prepare for the role? Vicky: Well preparing for an underwater shoot was scary and exciting; I didn’t really know what to expect. Everything was so quick and fast paced that it wasn’t so much about preparation, but more the case of once I’m in it, I’m in it! All the scenes were very intense, especially the ‘eye-acting’ shot as you are having to act solely with your eyes to convey a message. It has all been a huge learning curve for me. In the Born Again film I felt more confident than ever. Alison Darby: What is your favourite look from the Illamasqua films? Vicky: I think my favourite look overall was the “Bladerunner” look from the Vicky & Vic film, it was just a really fierce and dramatic look. I loved wearing the make-up it was incredible, I was like ‘WOW’ I looked so different and completely embraced it. I also loved Poem, it was a really soft beautiful look. Rachel Ryder: So far your career has been gritty British dramas. Do you have any comedies lined up? Vicky: I’m afraid not, its more grit! I have three more gritty films lined up with roles that I am extremely passionate about; although maybe not as dark as some of my past ones. I definitely want to do comedy, I am quite a happy person (laughs) and apparently I’m dead funny! Kenneth: What was it like going from a supporting role in ‘This Is England’ to leading character? Vicky: A dream come true! It was amazing for Shane to give me the opportunity. The story lines were incredibly hard and I had to work harder than ever before. There is nothing negative I can say about the whole experience, it’s everything I ever dreamt of.